The aftermarket situation for interior parts is very difficult with only few items available. So make sure that the car is complete and that the parts are in good condition. That is especially the case with the seats because they are nearly impossible to get. It is not of importance how the seats look like, because the soft vinyl in black or brown splits very easily so that seats need to be trimmed in any case. 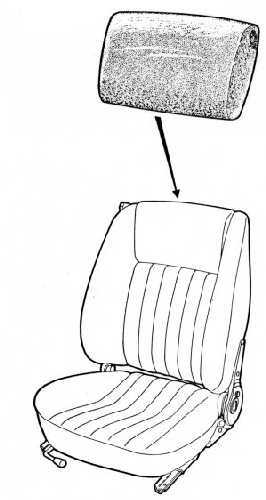 Make sure the mechanic of the seats is working and that the seats are original. Seats are having an integrated head-rest. It can be turned in different angles or can disappear in the rear of the seat. 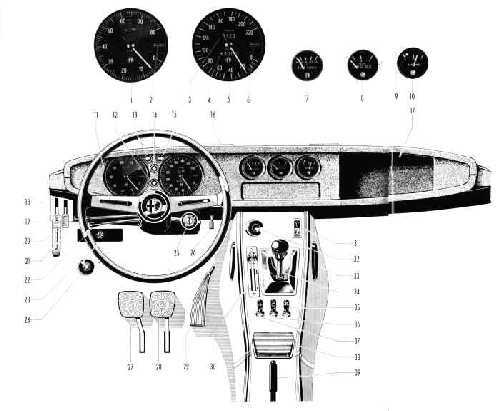 Headrest is shown in grey on the drawing to the left. The 1300 Junior Z came with rubber mats (not available anymore) whereas the 1600 had carpets. Roof insulation for the 1300 models (textile) was glued directly underneath the roof and tends to fall off. Make sure all the gauges are there and work properly. In the drawing below you see the rev-counter (1), the odometer(5), water temperature gauge (7), oil pressure gauge (8) and fuel-level indicator (10). The dashboard panels are made of black rubber and plastic. The plastic-softener escapes over the years and cracks are the consequence. Once again parts are very difficult to obtain. The rear hood can be opened a few centimeters by an electric motor (use switch marked 31 on the drawing above) to improve the air circulation in the passenger compartment. Be sure the motor is working - there is no spare motor available. In case the motor is defective it needs to be newly wound - an expensive exercise.